Before I start to pen my message, let us share a moment of silence to mourn the loss of a significant personality in our anaesthetic community - the demise of Dr Alexander Isaac Gurubatham on 22nd June 2014. Dr A I Gurubatham was one of the authors of the book "History of Anaesthesia in Malaysia" which was launched last year in conjunction with the Golden Jubilee Anniversary of the MSA. He will be remembered for his contributions to the anaesthetic fraternity and be missed dearly. May his soul rest in peace! On a happier note, we are proud to announce our successful bid to host the 6th World Congress of Total Intravenous Anaesthesia and Target Controlled Infusion to be held in June 2018 in Malaysia. Well done, Dr Raveenthiran Rasiah and our bidding team! What an appropriate theme for us, the unsung heroes! It is a fact of peri-operative medicine that the anaesthesiologist assumes a role that focuses on patient care and safety. The anaesthesiologist is also the risk manager managing patients with serious co-morbidities undergoing surgery. There has been so much advances in anaesthesia to provide safe and quality care for patients. We are no longer just a face behind the mask! I encourage all hospitals, public or private, to celebrate this day to create awareness in the community on the pivotal role an anaesthesiologist plays during surgery. The National Anaesthesia Day logo was designed by Dr Haslan Ghazali. Haslan, thank you for all the lovely designs that you have been doing over the years and the hard work that you have put in! The Executive Committee hopes that this logo will be maintained as the National Anaesthesia Day logo henceforth. Importantly, I would like to inform members that the MSA's Annual General Meeting (AGM) will be held on 26th April 2015, together with the Annual General Meeting of College of Anaesthesiologists. The venue will be confirmed later but please do make yourself available. I encourage a large attendance as the Executive Committee would like to make an amendment to the constitution for the AGM MSA to be held before the 30th of June, every year. The Annual Scientific Congress (ASC) will be held with the AGM. The Registrar of Societies Malaysia had rejected the constitutional amendment which was approved at the AGM this year as there were insufficient members present to vote on the amendment. Why have we decided to move the dates of our annual scientific meeting? The Executive Committee mulled over the decision to move the yearly ASC from April to June to accommodate the Masters' examination which is normally held over the months of April to May. At the AGM 2015, we will be discussing the Fee Schedule so that all members are on the same page on this matter. Yes, this joint meeting will be held in the beautiful Pearl of the Orient, Penang. The ASPA which is the Asian Society of Paediatric Anaesthesiologists will be held in conjunction with the ASC. You will not only be assured of an amazing scientific programme with updates on the advancement of anaesthesia as well as safe anaesthesia in children, but also an exciting social programme. There will be many world renowned speakers for both the ASC and the ASPA. Please come to broaden your knowledge with the experts who will be gracing our shores and enjoy the fun-filled activities lined up for you! On 7th August 2014, Dr Raveenthiran Rasiah, Dato' Dr K Mohandas and I, attended a Fee Schedule Meeting at the Ministry of Health Malaysia. Although we have been working on the relative value unit, the meeting was basically to look at current issues, new procedures in anaesthesia and charges for remote anaesthesia. We will be having a presentation on this matter during the AGM in April 2015. So again, there is more reason for members to attend this important AGM 2015. Congratulations to Dr Lim Wee Leong, Prof Felicia Lim and Dr Thohiroh Razak on their successful expedition to Vientiane, Laos. They conducted a 'Refresher Course for Anaesthesia' from 15th to 17th August 2014. They covered a total of 15 topics. It was indeed hard work as translation was required but I am sure it was an eye-opener for all. Please read their report in this issue. I am so glad we are able to reach out to our neighbouring countries. In recent years, there has been a lot of discussion in the ASEAN/Asian region on how we may foster and share expertise, knowledge and technology. Last year, I attended the MRA (Mutual Recognition Arrangement) meeting in Jakarta, a forum among the Presidents of the ASEAN Societies of Anaesthesiologists. This month, I will be attending a similar meeting among the Presidents of the Asian Societies. The WFSA mid-year report has been summarised in this issue. The document provides an overview of the WFSA programme objectives, an update of activity and achievements in 2014 and their future plans. They have launched the "Safe Anaesthesia for Everybody-Today" or "SAFE-T" which comprises of a couple of themes. Please do read the summarised article in this issue. We have plans to launch the Year Book 2013-2014 during the National Anaesthesia Day in October, in Kuantan, Pahang. Associate Professor Dr Basri Mat Noris is in the midst of finalising the articles to be published in the Year Book. You can be rest assured it will be a very interesting and informative read. The last year saw no applications. I urge members, especially those from the Ministry of Health, to apply as this is really an opportunity to obtain funds for your research. You may be awarded up to RM10,000 per research. WFSA Paediatric Anaethesia Fellowship Programme for six months at Christian Medical College Vellore, India, which is 2,400 bedded, multi-specialty tertiary care university. WFSA BARTC Fellowship General Anaethesia Fellowship at the Bangkok Anaesthesia Regional Training Center, Bangkok, Thailand, for one year. The first six months will be in a medical school hospital and then four months in two provincial hospitals. The remaining months will be back at the medical school to prepare for the final examinations. It is a hands-on training. Kindly write to the secretariat for advice on the application procedure if you are interested to pursue these fellowships. Please check the website for more information on the society's activities, as well as conferences. I urge members to use and read our Ovid journals to keep themselves updated. A password is required and this may be obtained from the MSA secretariat. The Malaysia Society of IntensiveCare (MSIC) and Department of Anaesthesiology & Intensive Care, Hospital Pulau Pinang recently organised the "Intensive Care Nephrology: Beyond BASIC Course" on 10th to 11th April 2014, at the Bayview Hotel, Georgetown. This course was organised in collaboration with the BASIC (Basic Assessment and Support in Intensive Course) and the European Society of Intensive Care Medicine. "Acute kidney injury occurs in 3 to 35.5% of patients with critical illness. The severe sepsis mortality approximates 43% in Malaysia, however, with the acute kidney injury, the mortality rate rise to 60%" quoted Dr Tan Cheng Cheng, President of the Malaysia Society of Intensive Care and Senior Consultant Intensivist, Hospital Sultanah Aminah Johor. With that short and precise statement the severity of the problem was aptly highlighted. The need for understanding and garnering knowledge on the problem, prevention and treatment possibilities is dire and acknowledged. Thus the objective of the course was to equip health care providers, namely the intensivists and the anaesthesiologists with the current literature and management techniques available in treatment of a patient with Acute Kidney Injury. There were a total of 24 anaesthesiologists who attended the course. The lectures focused mainly on the diagnosis and the various causes attributing to Acute Kidney Injury and the management of kidney injury. The modes of Renal Replacement Therapy (RRT) and the institution of RRT were also dealt with. To further consolidate the participants' understanding on the lectures, there were skill stations in peritoneal diagnosis, intermittent haemodialysis and hybrid therapies, continuous renal replacement therapy, and drug dosing in renal failure. The course days were intense and fast paced as the lectures and the skill stations were tailored to maximise the limited time and the mammoth amount of information available. However, in true Penang style, when the day of intense work was completed, the quest to enjoy the island and its host of sumptuous cuisine and heritage emerged. Suffice to say the course, amidst the lectures, participants and beautiful backdrop of Penang Island, was a resounding success. 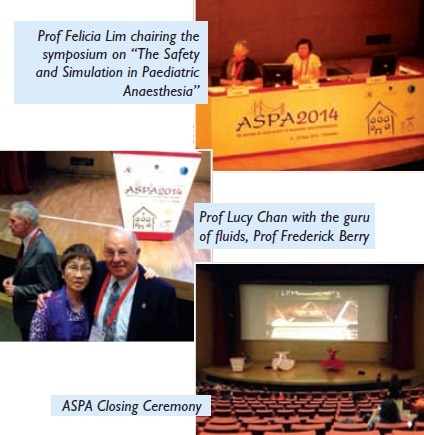 The Asian Society of Paediatric Anaesthesiologists (ASPA) had recently held its 12th Annual Meeting from the 8th to the 10th of May 2014, at the University of Acibadem, Istanbul, Turkey. The three days meeting had gathered more than 200 paediatric anaesthesiologists from many Asian countries. Our own MSA President, Dr Sushila Sivasubramaniam, accompanied by Dr Thavaranjitham a/p Sandrageran, Professor Felicia Lim, Professor Lucy Chan, Dr Intan Zarina, Dr Ina Ismiarti and Dr Sanah Mokhtar, represented Malaysia. The scientific programmes were comprehensive to cater to the wide interest in paediatric anaesthesia services. Many prominent speakers from all over the world shared the latest updates in paediatric anaesthesia, among them were, Professor Frederick Berry, Professor Jozef Holzki, Professor Rebecca Jacobs, Professor Jerrold Lerman, Associate Professor Agnes Ng, Associate Professor Keira Mason and Dr David Stewart. In addition, various workshops were held over the three days to enable the delegates to have hands-on experience as well. The saying "All work and no play, makes Jack a dull boy" was true at this conference as well. After attending long symposia, the participants then had the opportunity to let their hair down at the Gala Night. It was held on a special Bhosphorus river cruise. The view across the famous Bhosphorus River was beautiful. All participants were served with delicious Turkish food and were entertained with the famous Turkish belly dance. Istanbul is a very beautiful and unique city. We took the opportunity to visit the famous tourist sights in Istanbul such as Topkapi Palace, the Blue Mosque, Hagia Sophia, Spice Bazaar and the Grand Bazaar. Some grabbed the chance to relax and experience the Turkish bath. Some of us stayed a bit longer and had ventured out of Istanbul to other cities such as Gerome, at the Cappadocia. Going on the hot-air balloon in the Cappadocia is an experience that is highly recommended. The view from the hot-air balloon was just awesome. In short, the journey to Istanbul, Turkey, was a blissful experience. The meeting was successful; we updated our knowledge, met new friends and rekindled old relationships. Congratulations to the Organising Committee, headed by Dr Z Serpil Ustalar Ozgen. 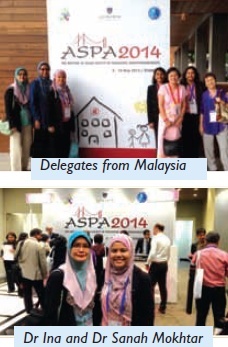 Next year, I am proud to say that Malaysia will host the 13th ASPA meeting in June 2015, in Penang. We hope to showcase refreshing scientific programmes and exciting social events in true Malaysian fashion. In this edition, we are going to dive into a world where many have dreamt of doing but very few have ventured into. We have Dr Jeyaganesh, senior lecturer at the Department of Anaesthesiology of University Malaya Medical Centre, sharing with us on his passion for diving. Jeya started taking up diving seriously after being posted as a house officer to the Queen Elizabeth Hospital in Kota Kinabalu, Sabah. For those who have had the experience of working in Sabah, we all agree that it is paradise on earth especially to those who love the outdoors. With beautiful mountains and breath-taking sceneries, Sabah is also blessed with some spectacular islands that are home to some of the best dive spots in the world. Jeya's interest in the sport began after being introduced to a girlfriend's brother who was a dive master and insisted that Jeya sign up for beginners lessons that will allow him to do open water diving (up to a depth of 18 metres). The EXACT motivation for signing up is up to our speculation but Jeya did well enough to proceed to obtain his license for advance diving (up to a depth of 40 metres). Jeya does agree that going through the proper training and classes were essential. "It teaches us from the start on being a safe diver and the do's and don'ts of diving. However, the only complaint I have now on diving is the cost. A dive these days costs almost three times what it used to cost me ten years ago. I attribute that to both a rise in costs associated with the equipment as well as the increasing popularity of the sport where more people are taking up courses and availability of places for training new divers by experienced dive masters are rather limited. I am lucky to have a group of friends with whom I regularly dive together, so we tend to share the costs associated with organising a dive trip." "In terms of favourite dive spots, Sabah remains one of my favourite destinations for diving, especially the islands of Sipadan and Mabul. Unfortunately, in view of the current security situation and to avoid a boat trip across to the Philippines for the wrong reasons, I have had to consider other places to pursue my interest. On the very top of my list of diving destinations that I have yet to do is the Great Barrier Reef off the coast of Queensland, Australia, but I am sure I will get to it one of these days," he says with a smile. I am sure that with the number of dives that he has done, he might have an interesting experience or two to share. He narrates to me one particular dive trip. 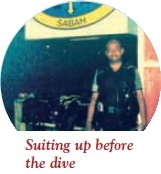 "This was one of the most difficult dives that I did and it was off the island of Sipadan about ten years ago. I was part of a group of six divers and we had to dive around an old oil rig at night. It was both extremely scary and exciting, as well as we were trying to capture the underwater sights especially of fishes that tend to come out more at night. It also was an experience in team building where we were watching out for each other to ensure we didn't get lost. The dive that night went rather smoothly and we were all pumped up for another exciting dive the next day. This time we were taken to an area known as the Barracuda Point. Again, everything was going on fine until suddenly, we swam into a pool of barracudas. I guess our presence must have angered them as they turned and swam towards us in a rather "unfriendly manner". I wished I could have said "Keep calm and eat kangkung " but it just wasn't to be. The six of us swam in all kinds of direction and split from each other. To make it worse, it was simultaneously getting really dark and I happen to notice the oxygen level in my tank was beginning to drop. I had no choice but to ascend slowly to avoid decompression sickness. When I reached the surface, to my horror, all I can see was the bright moonlit sky and open sea water, pretty much like a scene from Life of Pi minus the Bengal tiger. It felt like eternity but I was pretty much floating on my own for a good one hour before I noticed a small boat with a fisherman passing by. I shouted at the top of my voice and waved frantically at him and was sure glad that he noticed and began moving his boat towards me. He then brought me back to the initial drop off point where we first began our dive and I was soon reunited with all my dive buddies. I am sure glad that we lived to tell the tale that night." So, how do you prepare for a dive session, I asked Jeya. "It's not easy, but at the same time, if you put your mind to it, it can be done. It helps to have a group of dive buddies who share the same interest and being doctors; we understand our schedules better and work around them. I usually spend about a week at the dive site, so planning my diving holiday well in advance without causing unnecessary disruptions with my Department work schedule is important. 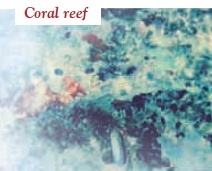 Once we have decided the place, then the necessary bookings with a reliable dive company is a must. We don't carry a lot of our equipment there as most of the reputable dive companies have all the necessary equipment; we just need to rent them. And don't forget the getting in shape part. We have to make sure that we are in shape so that we can do the dive without struggling. In terms of food, I usually pack a light meal such as a sandwich or a couple of energy bars and bottled water before a dive. I guess being a lecturer at one of the busiest teaching hospitals in the country, would somewhat reduce the amount of time Jeya can spend diving. "I agree, and on top of work commitments, I have a family, so I do have to spend time with them as well. It's much easier doing it when I was not married, but with two young kids, I make it a point to spend more time with them whenever I get a long break. This doesn't mean I am going to give up my interest, who knows when my kids are old enough; we would probably organise a family diving expedition." In parting, Jeya advises anyone who is interested in this sport to make sure that you undergo the proper training and dive with a reputable company. "The costs may be a bit more expensive but it's value for money as your safety is not compromised." 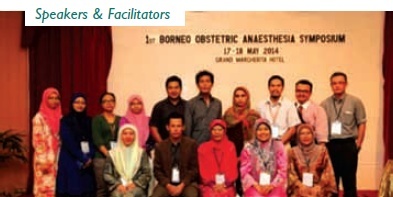 The Department of Anaesthesiology & Intensive Care, Sarawak General Hospital (SGH), successfully hosted the 1st Borneo Obstetric Anaesthesia Symposium on 17th & 18th May 2014, at Grand Margherita Hotel, Kuching, Sarawak. This event was a collaboration between the Malaysian Society of Anaesthesiologists, the Special Interest Group in Obstetric Anaesthesia of the College of Anaesthesiologists and the Postgraduate Medical Education Society of Sarawak General Hospital. The event was officiated by Dr Chin Zin Hing, Director of Sarawak General Hospital. Post-Operative Pain Relief for Lower Segment Caesarean Section. Seven distinguished speakers related to the field of obstetric anaesthesia graced this event. They were Dr Norasalawati bt Razak, Dr Nadia bt Mohd Nor, Dr Mohd Azizan Ghazali, Dr Hjh Thohiroh bt Abd Razak, Dr Norliza Mohd Nor, Dr Mohd Rohisham Zainal Abidin and Dr Mohd Zaini Abu Bakar. More than 180 participants from all over Malaysia, attended and benefited from the symposium. Six medical equipment and pharmaceutical companies also came to display their latest medical products that greatly expands the anaesthesia armamentarium. 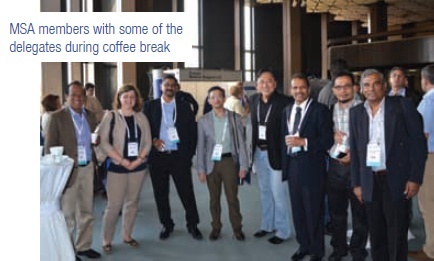 Besides learning and further inculcating new knowledge on obstetric anaesthesia, the symposium was a place of gathering of friends and former colleagues who were now working in different hospitals, to catch up on each other. All in all, the symposium had served its purpose in exposing and updating many anaesthesiologists in the management of obstetric anaesthesia. We hope that more of these symposia will be held in the quest to improve quality and care of the parturients. The use of ultrasound guidance for vascular access has grown over the recent years and may be part of a standard operating protocol in Malaysia in the future. 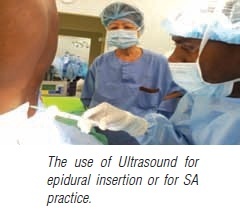 Although anaesthesiologists are not experts in its use and many can perform vascular cannulation via various landmark techniques well, it is imperative that the knowledge on the use of ultrasound for regional anaesthesia be applied for this purpose as well. With this in mind, the Department of Anaesthesiology, Hospital Kuala Lumpur, embarked on a structured regular "in-house" Vascular Access Workshops to educate members of the department on the use of this technology to assist in this respect. To educate members of the department on the use of ultrasound for vascular cannulation. Hands-on demonstration and guided sessions by facilitators on vascular phantoms. 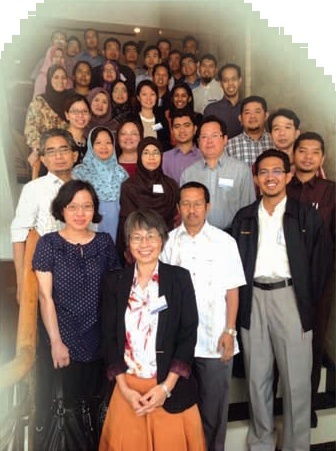 The first session was successfully held on Wednesday, 25th June 2014, at the Department of Anaesthesiology CME Hall, Hospital Kuala Lumpur, and was attended by 18 participants. This one-hour session was conducted by Dr Azrin Mohd Azidin and Dr Amiruddin Nik Mohamed Kamil, together with Absolmed providing technical support in terms of ultrasound units and blue phantoms during the facilitated 'hands-on'. To cater for the rest of the department's members, we hope to have this regular in-house vascular access hands-on session for the benefit of all specialists and medical officers in the near future. Hi everyone! Ever since I was asked to be the Editor of the newsletter of the Malaysian Society of Anaesthesiologists (MSA) and the College of Anaesthesiologists, AMM, taking over from Dr Shireen Jayan who did an excellent job the last five years, I was toying with the idea of having articles from anaesthesiologist in the private sector to be included in the newsletter as well. Our newsletter typically carries activities conducted by the MSA for its members, mainly focusing on CME programmes, meetings and conferences. Although the anaesthesiologist in the private sector represents nearly half the current anaesthesiologist population in Malaysia, we seldom get to hear their voices and the issues that they face in private practice. For the record, based on the current National Specialist Register as of 25th June 2014, there are a total of 498 specialists who are registered under anaesthesiology and critical care of whom 241 of them are from the private sector. And so with this editorial license, I hope that in the coming issues you will get to hear from some of us, and that our stories from the other side will shed some light to how private practice is in Malaysia. Bear in mind, this is strictly my personal views and not the views of the MSA. So, where shall I begin? The first question that normally any of my juniors ask me whenever we meet during conferences is "Why did you leave government service?" There are many reasons why private practice is alluring and of course, financial consideration is among the reasons on the top of the list but let's look beyond the ringgits and cents. For me, it was a question of either having the financial security of government service or the financial liberation that private practice offers. The salary, allowances and perks in the government sector have improved significantly over the years but being the main breadwinner in a family of three young kids, I often ended up doing a lot of after-office-hour work in order to cope with the increasing cost of living these days. And by doing that, I soon began to realise that I was spending less time with the family and when I do get some time, I will be so tired that meaningful quality time was not always available. As such, when the opportunity came, it didn't take too long for me to decide to go for it. I am sure that there are many others who have made the respective moves to private practice with money not being the prime motivator. Having said all that, I do miss some of the work that I did in government service. In fact, if not for the years that I have spent in government service learning my skills and clinical acumen from specialists and consultants, I would not be where I am today. For that, I owe a debt of gratitude to the seniors, many of whom have stayed on in government service continuing to train new doctors in this field. I still remember my first boss in anaesthesia, Dato' Dr Balan among his many lessons to me, asking me to check on every intravenous cannula that has been set in the ward to make sure it works 100% before administering our drugs to the patients in the OT. "When in doubt, just take it out", he said. I don't think he meant to be poetic that day, but what he taught me was the discipline and the right attitude to the job. Very often it's those small little things that we take for granted that usually catch us with our pants down when we least expect it. And that lesson on checking and being sure is still something I do religiously till today. What about the cases that we do in private practice? Not all of us working in private practice are in tertiary and quaternary level hospitals, as such, we do not do the type of complex cases that many of the specialists in the major government and university hospitals are doing every day. It's not that I crave to do a paediatric craniofacial surgery for craniosynostosis on a daily basis, but the routine can sometimes be mundane. Maybe one day there can be an arrangement on a more regular basis where private anaesthesiologists can also offer their services to the government sector patients, especially for the type of cases where the waiting period is long and the expertise from both the surgical and anaesthesiology discipline is under-utilised in the private sector. I would like to explore a bit on the areas concerning cost of healthcare in private practice. Ever since the revised Fee Schedule was announced early this year, doctors in private practice have been unfairly labeled as being insensitive to the general public and trying to capitalise on the sick by charging a higher fee. I would not go into the details of the unfair criticism hurled against us especially from the consumers associations but let me just try and illustrate a bit on how the financial mechanism works in the private sector. The professional fees of the doctors are regulated (both surgeon and anaesthesiologist) and it hardly crosses more than 30% of the total cost of hospitalisation. The general public seems to be oblivious to the fact that actually 70% of the total fee go to the hospital. The hospitals on the other hand, work on a mechanism where they are answerable to their shareholders. And if you are a shareholder, the words you would like to hear are the profitability of the hospital and the return of investment. The services, equipment and staffing are not funded by taxpayers money but by private funding mechanisms which includes borrowing of loans from banks and in some cases, raising of capital by floating the shares of the hospital on the stock market. As such, running a private hospital is an extremely complex affair where a balance has to be reached, i.e. the balancing act of delivering an efficient healthcare service to the public while ensuring that the business is not run to the ground. So, the criticisms are somewhat unfair to say the least. Nevertheless, if there are grievances, especially concerning unethical practices by a minority of doctors, the public should not be cowed into inaction as there are mechanisms in place within the individual hospitals itself or they can seek help from the Malaysian Medical Council to handle these issues in a fair and just manner. While on the subject of the Fee Schedule, I seriously urge our members to not treat the subject of the Fee Schedule lightly as in the future, both the government and private practitioners will be somewhat, affected by some of the discussions that are taking place in the corridors of power. We need to thank some of our senior members of the fraternity who are putting a tremendous amount of effort and taking up the cause valiantly for the benefit of the broader group of members. I sincerely hope that we can view the existence of both the private and public services as a symbiotic partnership. In the early days of private practice (late 70s early 80s), private healthcare was only affordable to those who had money. It was a willing-seller and willing-buyer model where the cost of treatment was outlined and the patient who was willing to pay the price will get access to specialised care in the private hospitals, leaving the larger majority of patients to seek treatment in government hospitals. Insurance was largely unheard of. Let us now fast forward to the present day. Although I do not have official statistics, the number of patients accessing private hospitals with their respective medical insurances either financed individually or via the employers/ corporations has far exceeded the individuals who use cash. As such, in a way, we are helping to offload some of the patients who are insured and having the financial means, who would otherwise, be overloading the resources in the public healthcare services. And on the point of a symbiotic public private partnership, I do have to thank our colleagues in government service who give us a hand in accepting patients especially when the patients have exhausted their financial capabilities to continue seeking care in the private hospitals. This is especially when an unexpected complication arises while inpatient or a patient who was very ill to begin with that, sought help at a private hospital, for example a polytrauma victim who is rushed into the A&E Department of a private hospital as that is the nearest hospital that can stabilise him before definitive treatment can be planned. This group of patients often requires the highest level of care which will include the involvement of a multidisciplinary team that will be using a lot of resources within the hospital. It is not surprising when sometimes the initial cost of treatment within the first 24 to 48 hours reaches about 20 to 30 thousand ringgit. Once the patient has been adequately stabilised, we then reach out for assistance in the public sector to accept the patient, not because of lack of expertise but to be fair to the patient and his family who will have a huge bill to pay at the end of the day if they do not have the means. Not many realise that the doctors are the last one to be paid as the hospital will be recovering the cost associated with the care of the patient first. Many a time, we have waived our fees in order to help the patient's family as well. So, again it's a bit unfair when you hear comments passed around that we have bled the patient dry and that's why we are transferring a patient to the government side. Fortunately, these comments are few and far in between, and usually come from people who are ill-informed on the actual circumstances. I hope I have given a little bit of a background to our life in private practice and in the next edition of the newsletter, I will cover some other topics of interest. If you do have any comments, questions or suggestions on what I can write on next, I would like to hear from you at gunalan73@yahoo.com. 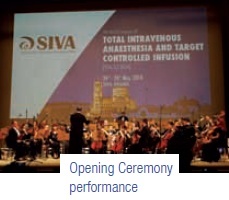 The World Society of Intravenous Anaesthesia (World SIVA) organised the 4th World Congress of Total Intravenous Anaesthesia and Target Controlled Infusion (TIVA-TCI 2014) which was held from the 24th to 26th of May, in Sofia, Bulgaria. Seven members of the Malaysian Society of Anaesthesiologists including five from the Executive Committee, attended the meeting. As a background, the World Society of Intravenous Anaesthesia was formed as a result of anaesthesiologists in most countries having developed a major interest in intravenous anaesthesia. This has been prompted in many cases by the availability of improved drugs, such as propofol and remifentanil, and the more widespread introduction of target controlled infusion systems. These factors, together with improved education, have led to growing awareness of the value of these new techniques for routine anaesthesia and also to the rapidly evolving area of conscious sedation. Several National and International Societies for Intravenous Anaesthesia were then established. 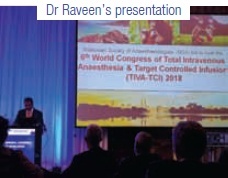 On 27th – 29th September 2007, the 'First World Congress of Total Intravenous Anaesthesia and Target Controlled Infusion' was held in Venice, Italy, followed by biennial meetings in Berlin in 2009, and Singapore in 2011. TIVA-TCI 2014 aims to improve the standard of intravenous anaesthesia in all corners of the globe. A high-level, interactive scientific programme, featuring internationally acclaimed anaesthesiology experts, will provide debating and networking opportunities, and hands-on practical workshops. 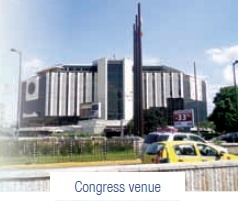 The congress venue was the National Palace of Culture and it provided a very cultural and historical backdrop to the proceedings of the conference. Sofia is one of Europe's most ancient capitals and was founded by the Thracians in the 7th Century BC under the name Serdica. The city was then conquered and developed by the Romans and it became the favourite city of Emperor Constantine the Great. Sofia's ancient history and cultural heritage was proudly preserved and it was evidenced throughout the city. The Opening Ceremony was graciously officiated by the President of Bulgaria, President Rosen Plevneliev. He gave a short but a memorable speech welcoming us to Bulgaria and hoping that we will enjoy our times there. After the speeches were over, we were treated to a live concert performance by one of Bulgaria's foremost opera singer, accompanied by their national orchestra. Another interesting event that took place in this year's meeting was also the voting to decide on the venue of the next two world meetings. Each participating country was given an allocated time of 15 minutes to present their bid proposal. France, Mexico and Malaysia took part in the process and our bid was presented by Dr Raveenthiran Rasiah. Via the voting that was conducted during the Annual General Assembly, Mexico won the rights to host the 2016 World Congress of Total Intravenous Anaesthesia and Target Controlled Infusion while Malaysia will be hosting the same congress in 2018. This was indeed an uplifting moment for us as we were still feeling the gloom of the missing flight MH370 during the conference. We now have a monumental task ahead of us in hosting a congress of this magnitude but having done a number of similar congresses before this, I am quite sure that we as a Society, will be able to pull it off. The World Congress will be planned to coincide with our Annual Scientific Congress. It should be well attended as it will be showcasing experts and researchers from all over the world converging in Kuala Lumpur, to present the latest developments on total intravenous anaesthesia and target controlled infusion. Another big win for us is that the venue of the congress will be the Kuala Lumpur Convention Centre, and it's not often a medical society will be able to hold a meeting at this venue. So, I strongly urge all members to keep a look-out for details concerning this meeting and to plan early to attend the meeting. All in all, it was a feeling of mission accomplished and we look forward to the road ahead as we prepare for the 2018 World Congress of Total Intravenous Anaesthesia and Target Controlled Infusion in Kuala Lumpur. Sabaydee, 'Welcome' to Laos. We landed safely at Wattay Airport, Vientiane, on the 14th of August 2014, Thursday afternoon after a 2 hours and 45 minutes flight from KLIA2. Thank God, we arrived at Vientiane unscatched! MH370 and MH17 tragedies were still fresh in our minds. We were greeted by a nice and friendly Dr Traychit Chanthasiri, the Deputy Head of the Anaesthesiology Department from Mahosat Hospital who was also our main local contact person for the programme. Our team members, consisting of Dr Lim Wee Leong as the team leader, Prof Felicia Lim and myself, were on the MSA ASEAN Travelling Fellowship, an outreach educational programme for poorly resourced ASEAN countries. A three-days Refresher Course starting from the 15th to 17th of August 2014 was planned to cover neuroanaesthesia, obstetric and paediatric topics. Since the inception of the programme in 2011, the Malaysian Society of Anaesthesiologists (MSA) have been hosting anaesthesiologists from Cambodia, Myanmar and Laos who came for short attachments of one to two weeks in Kuala Lumpur. Dr Traychit himself was involved in the programme in 2011 when he came to visit Hospital Kuala Lumpur (HKL) and University Malaya Medical Centre (UMMC). We were then driven to our hotel, the Orchid Hotel in a 7-seater Hyundai Trajet MPV donated by the Japanese Anaesthesiologists Society. According to Dr Traychit, Laos depends a lot on funds and donations from countries such as Japan, Korea, China, Germany and Australia, just to name a few who help to develop their country after years of unsettled political conflicts. The uncertainty in the political climate also impacts the health development of Laos. It is the 10th poorest country in the world with a high maternal mortality rate of 470 in 100,000 live births when compared to Malaysia which is around 29 in 100,000 live births as reported by the World Bank in 2010. The country is now governed by Laos People Revolutionary Party since 2000. It is a one politicalparty system which is still struggling to develop Laos despite the international help. We took a quick lunch in our nice, cozy hotel before our first visit to Mahosat Hospital, the biggest hospital in Vientiane which was to be the venue for our course. Assoc Prof Dr Ounkham Phantaly, the Hospital Director who is also the President of the Laos Society of Anaesthesiologists, was already waiting for us. As an anaesthetist, he was grateful that we were willing to come and share our experience with their doctors. He invited not only the anaesthetists, but also other clinical staff to attend the event. He even stopped all the elective theatres on Friday to ensure everyone attended the course. It was an effort we appreciated very much. According to him, they do not have much allocation to conduct clinical courses, thus, any courses coming by should not be missed by his clinicians. He reckoned that for the current population of 6 million people, Laos needs about 150 anaesthetists but they only have 70 at the moment. The first day saw about 120 excited participants filling the auditorium to the brim. A big banner nicely decorated the stage, in both Laotian and English languages highlighting the course. 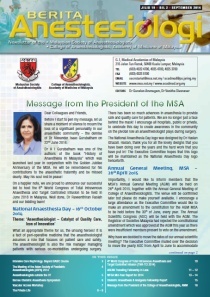 The Malaysian Society of Anaesthesiologists (MSA) logo was printed alongside the Laos Society of Anaesthesiologists, a symbol of friendship of both countries. Dr Ounkham officially opened the course and hoped everyone would benefit from the course. We also took the chance to present our gifts to Dr Traychit and Dr Ounkham as a gesture of goodwill from MSA. A total of 14 lectures were presented and discussed throughout the three-days course. The four paediatric topics delivered by Prof Felicia Lim were Physiological Changes in Paediatrics, Airway Management, Fluid Management and Pain Relief in Paediatrics. I presented the obstetric lectures which were Physiological Changes in Parturients, Management of Labour Pain, Pre-Eclampsia and Management of Post-Partum Haemorrhage. Neuroanaesthesia topics covering Understanding Neurophysiology, Management of Head Injury and Fluid Management in Adult Patients and Anaesthetic Management for Trauma and Head Injury Patients were presented by Dr Lim. Delivering a lecture in a non-English speaking country like Laos was a challenging task. Every sentence needed to be translated concurrently. A joke can only draw laughter after being translated. Sometimes, this limitation did affect the presentation as some lengthy explanation on certain difficult issues might not have been translated properly. However, kudos to Dr Traychit and his two other anaesthetists who translated our presentations as well as they could. They seemed to be very professional in doing that. We were later, told that they do have visiting anaesthetists from Australia, Germany and French who voluntarily came to train their trainee anaesthetists and translations are done similarly. Even though initially we did not expect much interaction because of the language barrier, it was proven otherwise. 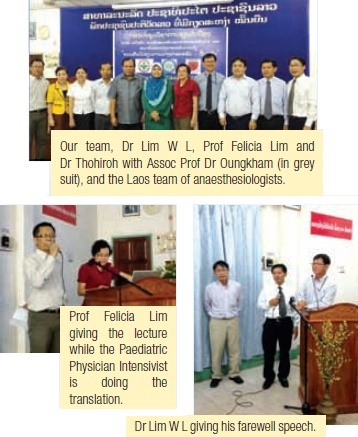 Pleasantly, the Laos doctors showed their eagerness to learn and many questions were raised. We were also a bit apprehensive on the response of the participants after the first day. In fact, we were worried that the numbers might dwindle down over the next two days since the course was conducted over the weekends. For the doctors, weekend is meant to rest unless one is doing call duty. Any teachings should only be done during the week days. But we have changed that, since many of them stayed till the very last day on Sunday. Even the director himself attended most of the three-day sessions. Outside the course, we learnt a lot on Laos and its people. Life in Laos can be described as laid back, a statement which was also agreed by a Scottish teacher who was already in Laos for nine years. We met him at the airport while on our way back home. He taught English to the airport officers, pilots and flight attendants. Everyone seemed to take their life easy. There are still many smiling faces around in this capital of Laos, Vientiane. The doctors would bow slightly while passing you as a sign of respect, something that used to be a norm in our country. There were not many teenagers or beggars seen loitering around the streets unlike in many other bigger cities in the ASEAN region. Hyundai and Toyota cars are the preferred vehicle in the streets of Vientiane. What surprised us was no traffic congestion in the city, unlike KL! Money, however, was not plentiful here. A resident or medical officer is only paid US300 or 24,000 Kip. Food is quite expensive as most raw products are imported from Thailand. Laos was initially an agricultural country; however, its main products now are textile, semiprecious stones and electrical items. We also took the opportunity to visit the sights in Vientiane after our evening lectures. Victory Gate or Arc de Triomphe of Laos, a monument built by courtesy of their previous French rulers, can be seen from afar. 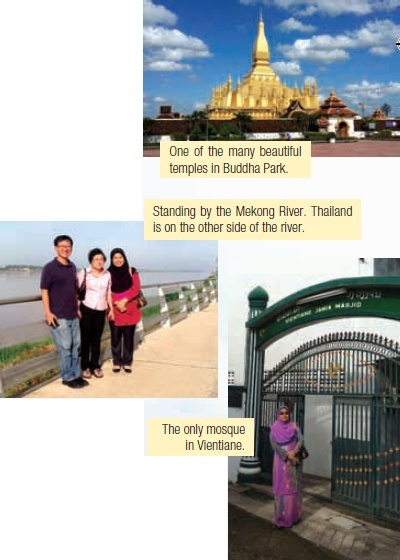 The gigantic structure serves as a landmark of Vientiane city. The concrete monument was built in 1960; unfortunately, funds were inadequate to completely finish the decorations except for some elaborated paintings in the inner part of the arch. Laos is also known as the Land by the Mekong. The river splits Laos from Thailand. A nice, flat, panoramic spectacular landscape with Thailand on the other side of the Mekong River, can be viewed from the top of the Victory Gate, if one dares to attempt to climb the seven-storey gigantic structure. Buddhism being the main religious belief in the country, explains why there are many beautifully built temples with intricate designs around the city. In fact, the temples are more beautiful than the Mahosat Hospital. The famous Buddha Park is a must visit place for most tourists. More than 200 Buddha and Hindu statues can be found in this meadow. Though Buddhism is the main religion here, other religions such as Islam are also practiced here. The main Islamic community is the Indian Muslims who are mostly traders. Vientiane Jamia Masjid mosque is the main centre for the Muslim community here. Halal food was also just around the corner which was a pleasant surprise that I appreciated very much! In conclusion, the refresher course has successfully established some educational ties between Malaysia and Laos. During the closing ceremony, Prof Dr Ounkham expressed his sincere gratitude to our team who untiringly and patiently shared our knowledge despite some language limitations for the three consecutive days. Dr Lim Wee Leong who led the Malaysian team also thanked the Laos anaesthetists and their residents for the overwhelming support for the programme. We would also like to take this opportunity to thank the Malaysian Society of Anaesthesiologists for arranging this exciting programme which we believe, not only will benefit many of poor ASEAN neighbouring countries, but also gave an eye-opening experience to us to appreciate the wealth of our beloved land, Malaysia. Till we meet again, 'Laa Gawn' everyone. We present highlights of a mid-year report done by the WFSA for the year 2014 which was prepared by the CEO, Mr Julian Gore- Booth. For your information, the WFSA was founded after the end of the Second World War when anaesthetists had a desire to learn from others and exchange experiences which then led, through a series of other meetings, to the establishment of an Interim Committee which met in 1953 and 1954. In 1955, the first World Congress of Anaesthesiologists was held at Scheveningen in the Netherlands, and at the end of the Congress, the WFSA was formed. 26 Societies were represented then with a further 16 observing. As of the last World Congress meeting held in Buenos Aires in 2012, there were 125 Societies. The Malaysian Society of Anaesthesiologists joined WFSA in 1968, and we are proud to acknowledge the fact that some of our members have played an active role in the WFSA, including the post of the President of the WFSA as well. The next WFSA World Congress will be held in Hong Kong in 2016, so keep a look-out for details. This document provides an overview of our programme objectives, an update of activity and achievements so far in 2014, and a look ahead to the remainder of the year and beyond. 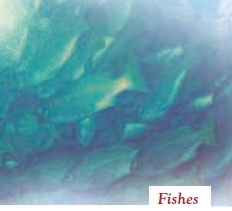 Full report can be read at http://www.wfsahq.org. Aim: To support and promote a focus on the availability, safety and quality of anaesthesiology. Objective 1: To encourage national and global decision-making that promotes the availability of safe and high quality anaesthesia. Objective 2: To promote anaesthesia and surgery as an essential element of global health – to address the global crisis of unsafe surgery. WFSA has been a key influencer at the World Health Assembly and WHO Executive Board on strengthening Surgery & Anaesthesia as a component of universal health coverage (Dr David Wilkinson was able to attend the WHA and address the WHO Board in Geneva). We have also been actively campaigning against possible international restrictions on Ketamine with over 4O member societies and regional sections writing to health ministries and the WHO's Expert Committee on Drug Dependency. This was followed up by Dr Jannicke Mellin-Olsen's representation of WFSA in Geneva in front of this Committee, to explain our concerns about any further restriction of this essential drug. WFSA also helped to ensure that anaesthesia was included in the WHO draft action Plan "Every Newborn" which aims to reduce preventable deaths amongst new born children around the world. The programme will bring the separate strands of activity together under the recently agreed "Safe Anaesthesia for Everybody – Today" or "SAFE-T" banner. Surgery & Anaesthesia as part of the Sustainable Development Goals (which will replace the Millennium Development Goals or MDGs). World Health Assembly Resolution on "Strengthening emergency and essential surgical care and anaesthesia as a component of universal health coverage". The WFSA will continue to work with WHO and other partners to promote the adoption of a resolution on this subject at the World Health Assembly, in May 2015. The Lancet Commission on Global Surgery – WFSA will provide further support and feedback to the Commission through Dr Iain Wilson. Follow up on Ketamine & the Every Newborn action plan. If the Ketamine decision goes against us, we will need to respond. Every Newborn is a high profile area and provides part of the link that WFSA has with Mother and Child Health. Measuring – promotion of the Peri-Operative Mortality Rate (POMR) or other measure that would ensure that we / the international community know if change is happening. Aim: To enhance patient care worldwide by working collaboratively to create, develop and strengthen the education and training of anaesthesia providers everywhere. Objective 1: To provide fellowships and other grants to young anaesthesiologists. Objective 2: To strengthen the global capacity to deliver safe anaesthesia and to train anaesthesia providers. Objective 3: To develop and deliver high quality educational materials for anaesthesia providers worldwide. The advertising and selection process for fellowships has been improved and is going well. Santiago (paediatric anaesthesia), Nairobi (paediatric anaesthesia), Kuala Lumpur (obstetric anaesthesia), applications have now closed. We have also been advertising positions in Botucatu, Brazil (pain management), Buenos Aires (pain management) and Fortaleza, Brazil (regional anaesthesia). We are advertising for external teachers to assist with the Palestine Anaesthesia Teaching Mission (PATM) next year. Anaesthesia Tutorial of the Week (ATOTW) number 308 has been published. Update in Anaesthesia (UIA) should be published soon. We have recently received US$9,000 from Baxter for the development of a virtual library and resource centre on the WFSA website. This will allow for improved presentation and an improved search facility – not only for UIA and ATOTW but other open resource material that WFSA recommends. This will make the WFSA increasingly useful to anaesthesiologists around the world. WFSA would like to be able to offer more fellowships with a sustainable and strategic set of funding partners. WFSA needs to publish ATOTW more frequently, more volunteers are needed. UIA needs to publish twice in 2015 if it is to remain an annual publication. Both ATOTW and UIA will be presented on a new virtual library on the WFSA website. We also have the opportunity to start offering scholarships for anaesthesia training provided by others around the world – for example, the French Montpellier University offers a postgraduate qualification in anaesthesia which is delivered in Dubai with the Dubai health authority. A scholarship for this would cost WFSA around US$11,000 – US$12,000. WFSA has made an application to the Air Liquide Foundation. This seeks to pilot the delivery of SAFE Obstetrics courses in Togo along with some equipment (Lifebox Pulse Oximeters), in 2015. Hopefully, this will expand to other countries in subsequent years. Aim: To promote global standards in anaesthesiology. Objective 1: To promote and maintain the International Standards for the Safe Practice of Anaesthesia around the globe. Objective 2: To provide guidance concerning the professional wellbeing of anaesthesiologists. The International Standards were last updated in 2010 (they were reviewed and left unchanged in 2012), so an update is back on the agenda of the Safety and Quality Committee. A checklist for use by health departments (to carry out self-assessment against the standards) or by NGOs (to provide a snapshot of anaesthetic practice in a country or between countries) has also been developed and is now available on the website. Updating and disseminating the International Standards. Aim: To promote innovation and research in anaesthesia. Objective 1: To seek out, test and endorse innovative equipment, drugs, learning or methods for safer anaesthesia in resource poor settings. Objective 2: To promote and support research into anaesthesia, with a focus on the areas of innovation, safety, education and anaesthesiology in resource poor settings. WFSA is negotiating a partnership with IARS. On the one hand, this would focus on developing and contributing to a Global Section in A&A, and we hope that a related strand would provide additional support for research – especially in Low and Middle Income Countries. WFSA hopes to secure US$30,000 from Baxter to launch the Innovation Awards. This will recognise innovation in Anaesthesiology in High, Middle and Low Income countries and will be announced this year. The plan is that five Awardees will be chosen in 2015, and will receive their awards at the WCA in 2016. In 2014, WFSA is again offering three grants of US$8,000 each to young researchers from LICs. Financial resource aside, it would be fairly easy to expand the Innovation & Research Programme. The IARS / A&A partnership extends our reach and profile. We can offer more Awards, more research grants for LICs, more scholarships with Harvard. As a junior Anaesthetist with two years of experience working in one of the sub-Saharan developing countries, Rwanda, I faced a lot of shortcomings. Rwanda was among 11 countries that had high levels of maternal mortality in 1990, but has already reached, in 2013, the MDG target of a 75% reduction in maternal mortality rate. However, severe bleeding and pre-eclampsia are still the main causes of death in a Rwandan pregnant woman. In order to answer to the obstetric patient needs, I decided to subspecialise in Obstetric Anaesthesia and Analgesia to complete care that my fellow obstetricians and other health care providers can provide. So, under the supervision of Professor Yoo Kuen Chan and thanks to WFSA sponsorship, I spent time in the University Malaya Medical Centre (UMMC) in Malaysia. The following describes the main activities during my stay in Malaysia from 10th February to 6th August 2014. When I arrived at UMMC on the 10th of February, I was received by Professor Yoo Kuen Chan who introduced me to Administrative team and thereafter, started the process of registration with the hospital which took one day. The second day, I was introduced to the Obstetric area by Prof Y K Chan who first showed me her motto "Two lives: may they bloom under our care" underlying two magic words: "lives" and "care" highlighted on the obstetric whiteboard. Actually, when she explains this, you begin to understand why more than about 2.6 millions of babies are stillborn whereas half a million mothers die when they are giving life. All these may be attributable in part to the shortcomings of care by care providers plus the parturients themselves. During my introduction to the Obstetric surgery area, I noticed that there are two operating rooms (also known as Obstetric OT) one for elective list and the other one for emergencies. I noticed also they are a recovery room with four equipped beds and 20 beds for a labor ward. From the third day, I started my fellowship as an observer until 28th February, when I received my permission to practice in Malaysia. Most of the cases we did were elective lower section for cesarean sections (LSCS) under regional anaesthesia (RA), especially spinal anaesthesia (SA). The regime was 0.5% heavy bupivacaine, 2mls average, plus fentanyl, 15mcg average. The spinal needle was always Pencan-type, size 25, rarely 27. In some cases like suspicion of prolonged operation due to multiple scars and/or plus planned tubal ligation or in high risk patients like severe pre-eclampsia in the goal of giving titrated LA doses, combined spinal epidural (CSE) anaesthesia was chosen. The use of Ultrasound scan of the spinal process has been recently emphasised in the unit. This new practice was done for elective and emergencies of lower grade urgencies. I have seen patients of all varieties, from the otherwise healthy (ASA I) to the high risk (ASA III/IV) patients. I was also encouraged to have a plan of management for every patient, including the return of the patient to the wards or to the HDU/ICU post-operatively. Analgesia in labor ward was also our point of interest. In UMMC, they use different methods to provide care regarding labor pain: Entonox, meperidine+phenergan and epidurals. Every labor room has its own Entonox supply. When the patient does not have indication of epidural or if she is waiting for it, she can meanwhile, use Entonox at will. Anaesthetists assist in the provision of analgesia by the insertion of epidural catheters or combined spinal-epidural placement. When the patient needs epidural, the request is addressed to the Anaesthesia team in Obstetric, especially to the MO on call. The medical officer or a specialist in Anaesthesia sees the patient, and after quick review of history, physical examination and the investigations, the patient receives explanations concerning the epidural insertion (interest and side-effects) and signs the consent. The use of ultrasound for spinal process scan depends on the operator (the availability, the difficulty with access to the spine and the experience of the operator). The main objective of my fellowship was to understand how to provide care to the obstetric patient, from the otherwise healthy to the high risk and to manage pain either during labor or after the operation. Some cases were new for me and I had the opportunity to learn about pregnancy in Uterus Didelphys as well as severe bleeding secondary to Dengue Fever in pregnancy. I am glad to be the first WFSA Fellow in UMMC to do Obstetric analgesia and anaesthesia and being supervised by Prof Y K Chan who is a real hands-on person to supervise in this matter due to her extensive experience. First of all, I thank the WFSA through its Educational Committee, for their help in giving all the necessary assistance to do my fellowship and survive in Kuala Lumpur. I present my thanks to the Government of Rwanda, through the Ministry of Labour, which provided the permission to be on this six month Study Leave. Thank you very much Professor Y K Chan, who was willing to accept the responsibility to supervise me without knowing me. My thanks also go to the UMMC through the Anaesthesiology Department, especially the Head of Department, Professor Marzida Mansor, who accepted to enrol me as their staff. Thank you also for the educational tools (different books written by the department to be shared with the providers back in Rwanda), you granted to my department. I would also record my thanks to the Malaysian Society of Anaesthesiologists (MSA) who sponsored my attendance in the April Annual Congress and the pre-congress obstetric anaesthesia workshop where I learnt all about simulation in obstetric patients. Last but not least, 'thank you' to all who have supported me, from far or near. Your endeavours have not only supported me but also the health care system in Rwanda, especially the pregnant women there. You have our eternal gratitude… May God bless your goodwill, and provide you with as much goodwill as you have so generously showered me with. The guidelines have been printed and distributed. It was agreed to launch the guidelines at the Opening Ceremony of the 3rd Daycare Surgery Conference on 4th September 2014. Dato' Dr Azman Abu Bakar, Director, Medical Practice Division, Ministry of Health Malaysia, officiated the Opening Ceremony. The contents of this guideline covers a spectrum of areas ranging from hand washing, antiseptics used, sharps use and disposal, theatre wear, cleaning of anaesthesia machines and other apparatus and lastly, the recommendations for pre-operative hand decontamination as well as performance of peripheral nerve block. A huge vote of thanks to the committee that put it together and I hope that you make sure you get a copy for your reference. It will be available on the College website as well! I hope that the NSR CPD credit points system could be implemented soon as this will serve well for the private practitioners who need software to log in their CME points. Prof Dr Lim Thiam Aun is our representative in charge of this, and potential organisers of meetings / conferences under the banner of College, need to let him know. I met the President of the College of Anaesthetists of Ireland, at the meeting in May 2014, in Singapore. The Irish College has stated that it would bring the preparatory course to Malaysia at the end of October 2014. A flyer would be prepared to publicise the event and we should try to get candidates from the region for the course. Four out of five candidates passed the MCAI (Part I and Part II) examinations. Prof Dr Lim Thiam Aun highlighted that the TIVA for Trainers workshop were held on 17th August 2014, at the Shangri-La Hotel, Kuala Lumpur. Participation in the workshop was by invitation only. The conference was held over two days with three workshops that were held on the afternoon of 4th September 2014, at Hospital Kuala Lumpur. Please watch out for the write-up of the conference in our next newsletter. Fluid Therapy in September 2014 in KL Hilton (Prof Dato' Dr Wang Chew Yin) – one of the speakers was not free. If a replacement speaker is obtained, then the meeting will be held. Sponsor: Fresenius Kabi. 10th WINFOCUS World Congress, 15th to 19th November 2014, at The Royale Chulan, Kuala Lumpur – special registration fee based on endorsement. The Neuro Anaesthesia Symposium, were held on 19th & 20th September 2014 at the Auditorium, Medical Academies of Malaysia. College AGM, tentatively on 26th April 2015, in Kuala Lumpur. College / MSA Annual Scientific Meeting, 12th to 14th June 2015, Equatorial Hotel, Penang. 26th to 28th August 2014, Shangri-La Hotel, Kuala Lumpur. The College of Anaesthesiologists, in conjunction with Department of Anaesthesia and Intensive Care, Hospital Kuala Lumpur and Kementerian Kesihatan Malaysia, will be hosting a variety of events to showcase the strengths and the work of the anaesthesiologist. The theme for the National Anaesthesia Day 2014 is 'Anaesthesiologist – Catalyst of Quality Care, Icon of Innovation'. This year, we seek to showcase four articles in the FIT4 LIFE segment of THE STAR that aptly contributes the meaning of the theme and the celebration. Watch out folks, for these articles! Keep your eyes glued to the College website for further details, and your participation at these activities is of utmost importance. I take this opportunity to wish a belated Selamat Hari Raya to all my Muslim friends and Happy Deepavali to all my Indian friends.